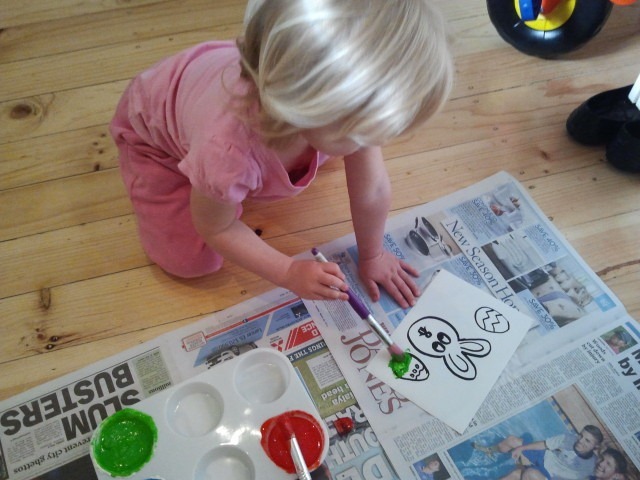 Making the most of Easter’s imminent arrival AND Pebble’s obsession with the Easter Bunny (“is it Easter day now, Mummy?”) I pulled out the old puffy paint trick. Have you ever tried this? It’s quick, easy, fun and effective. containers for your paint – you can use old yoghurt pots, an egg carton, or I have this nifty plastic one from Riot Art and Craft (I spend WAY too much time and money in that place). 1. In each container or paint well mix together the self raising flour, salt, food colouring and water until you have a thick paste consistency. If you’re in the mood your little one can help. On this occasion I chose to do the mixing myself – the paint wells are a little small and delicate on my palette to allow the enthusiastic mixing of a two year old. 2. 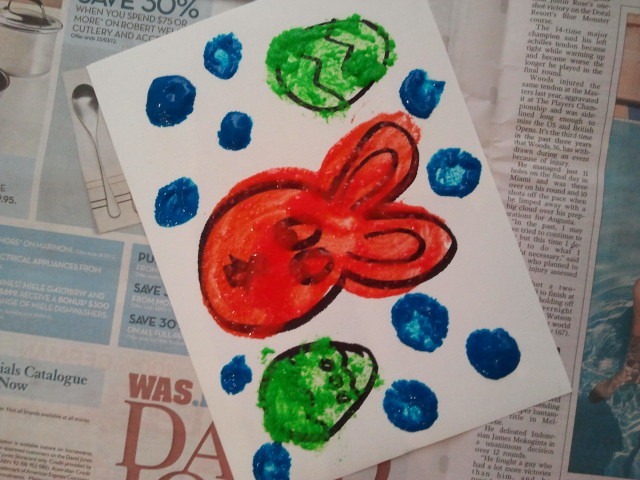 If you’re doing the Easter thing, draw a picture of something Easter-ish on the paper for your toddler to paint over. Or freestyle it and let them get creative on their own. 3. Spread the newspaper out and prepare to get stuck into it! 4. 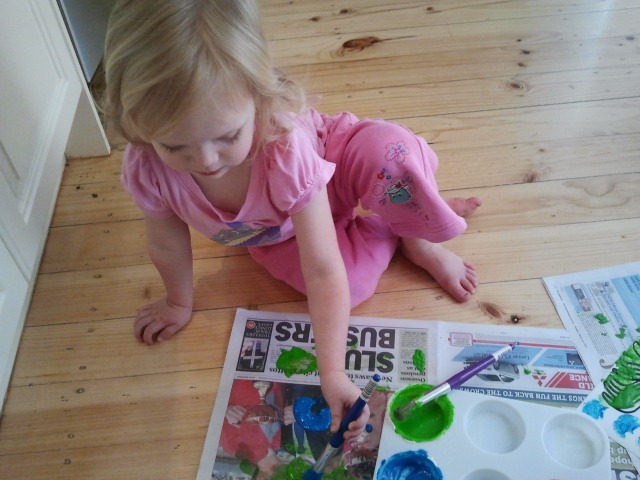 Hand the paints and paint brush over to your toddler and let them go nuts. 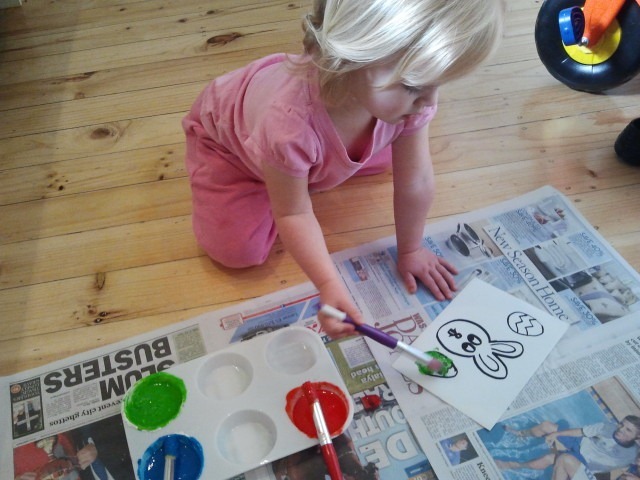 Pebble is quite a careful painter, she likes to be neat. However she soon discovered that slathering the puffy paint onto the newspaper is just as much fun as painting Easter pictures. If not more so. 5. Together put the art work into the microwave and set it on high for about 20 seconds. This is a good time to get all educational and talk about the numbers, practice counting down to zero. Watch through the glass as the paint puffs up. 6. 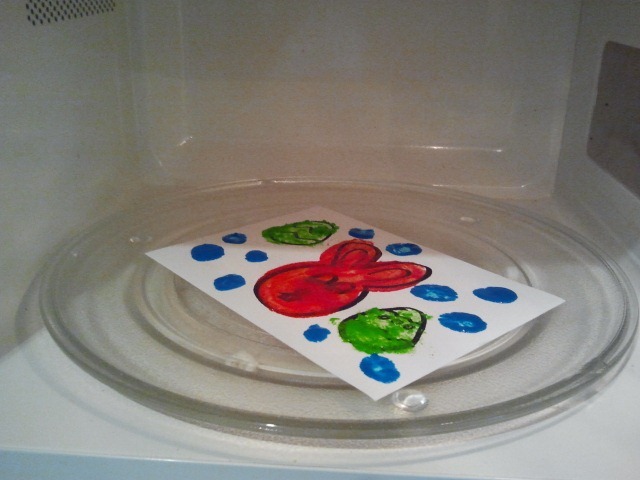 Allow to cool a bit before taking it out of the microwave, then ask your toddler to choose somewhere to display their art. Got a baby? Try some puffy finger painting. I recommend you take it outside and have a bucket of warm soapy water handy along with a flannel or old cloth nappy for cleaning up. Got a preschooler? 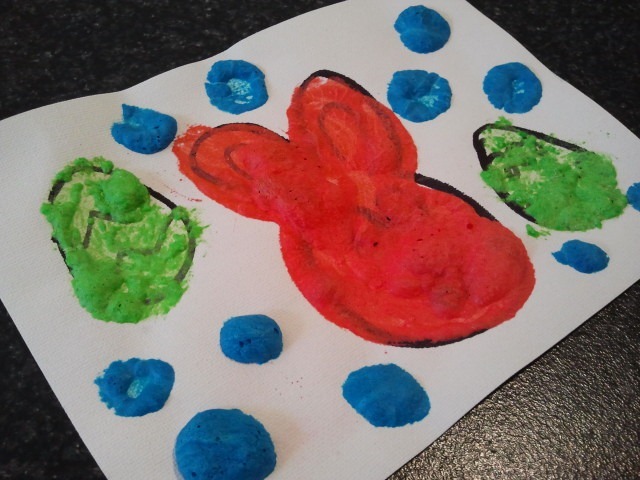 This activity works just as well with preschoolers, but you could also ask them to draw their own Easter picture to paint. Got a school kid? Help them to make their own paints, try experimenting with making different colours by mixing up your reds, blues and yellows. Encourage them to do a freestyle Easter picture. I like to be organised. But at the same time I often find myself chaotically disorganised. Does that make sense? I guess liking to be organised doesn’t always translate into action. Like many other peeps out there I’m juggling, balancing, trying to get this mothering gig to mesh with this working gig. Some weeks I kick arse, and some weeks I am drowning in stuff. I find it helps to arrange the stuff into some kind of order, to keep the drowning to a minimum. Here’s a couple of things I do. I hope they help keep your head above water too. Every Sunday or Monday I quickly take stock of the food stuffs in the house and make a meal plan for the week. On the days that I don’t work I generally batch cook fresh meals (I look forward to sharing those with you all soon), and on the days that I work we scoff down a pre-prepared home cooked meal from the freezer. The weekends are often busy with socialising, so we go with the flow. My favourite plan for a Sunday is “Fridge Raid!”. As simple as that. I got my menu planner from Olliebird. 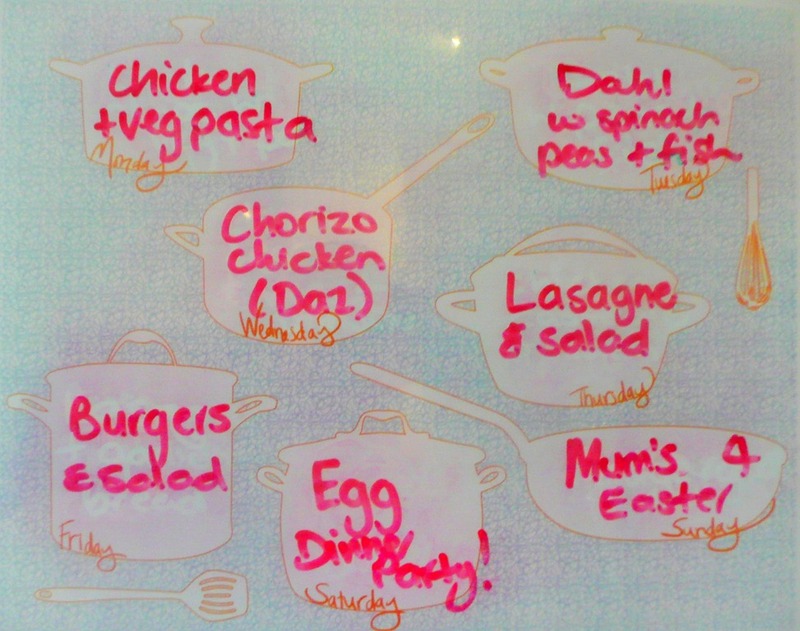 Want some other ideas for meal planning printables? Deb at Home Life Simplified has an awesome breakdown of some online goodies. Love that woman. I have previously shared my love of techy stuff, but what you don’t know yet is that I love stationary. Who doesn’t?! Especially those of us teacher folk. Kikki K is a shop close to my stationary-loving heart. 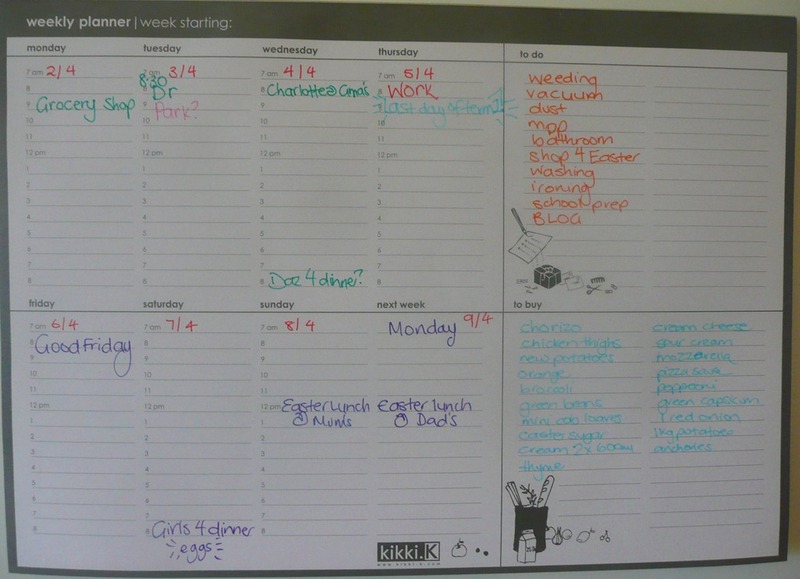 A birthday voucher last year resulting in a big WIN when I finally bought one of these weekly planning pads (Thanks Kel! x). I use Google calendar on my lap top and my Android phone to keep track on things on the go, but sometimes nothing beats good old fashioned paper. I love crossing things off my to do list, quickly adding things to a shopping list as I run out of them and having my week mapped out at a glance. You can buy your own Kikki K weekly planner pad for just $9.95. 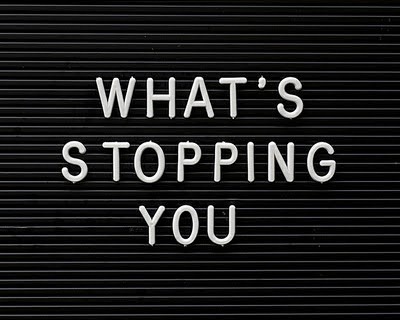 So, I thought, how can I make the most of my addiction, and probably your addiction too, if you’re reading this, am I right? I’m going to make your day, because this little blog is going to be sharing fun and fabulous techy things all the time. Like, weekly. I’m calling it: Click. This week? Something for the little ‘uns and something for the school kids too. Next week? Who knows… maybe some fashion, maybe some blogs, maybe a new gadget, you’ll have to wait and see. Fun! Poisson Rouge (French for Red Fish) is a labyrinth of fun, easy, interactive games for little kids. It’s great for teaching the smallest of hands to use a mouse as they click and click and click all over the page. Almost anywhere you click will take you to somewhere exciting or make something amazing happen. You almost can’t go wrong. Oxford Owl looks a little more studious, but don’t be fooled, it still has plenty of fun factor. I use this a lot in the classroom, especially during guided reading sessions. I hook up the six-way headphone set to the PC and BAM! instant listening centre. Plus, many of the books come with follow up games and activities to teach literacy concepts from the story. I’m sure kids would have fun reading with this at home. 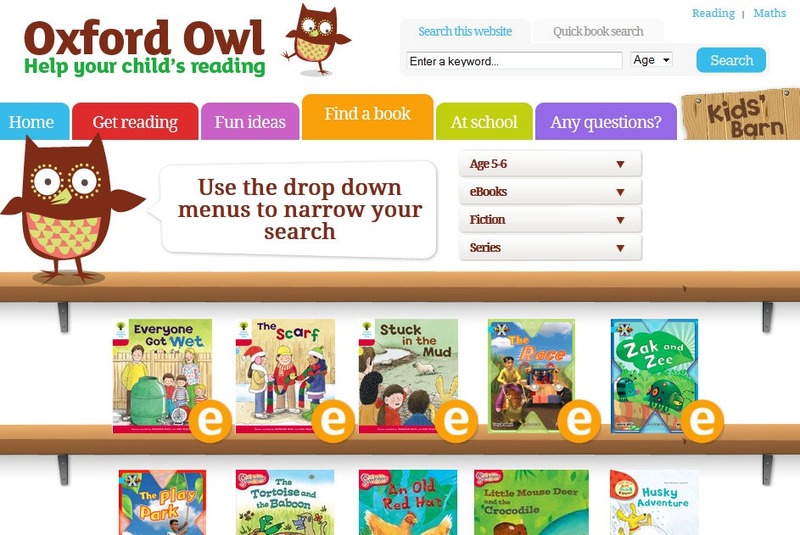 Books are levelled by age, and can be searched for by genre, book type and series. Have you found any fab clicky places for kids lately? Please do share them in the comments. This morning we had a Craftmergency! This means we needed CRAFT and we needed it NOW. Craftmergencies usually occur when Pebble is craving some one on one time and needs entertaining. Sure, I might have piles of washing and dishes to get to, meals to plan, teaching work to prep, but none of that is relevant to a two year old. 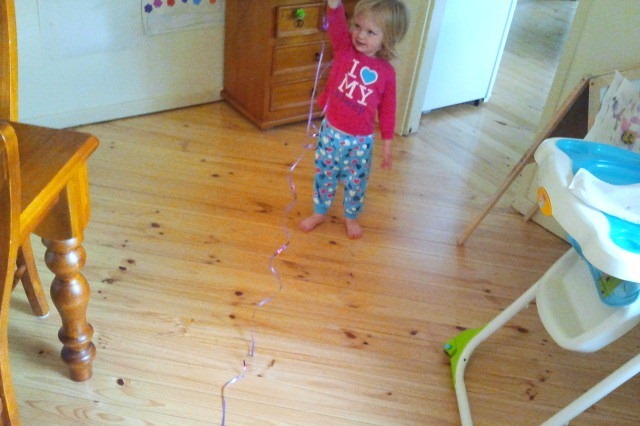 A two year old who wants her mummy. I had been saving up some Easter ideas for this week (it’s not long until the Easter Bunny arrives! ), and this was the perfect opportunity to implement my master plan (mwahahahahaha!). 1. draw your egg shape onto a piece of card and cut it out. Use this first egg to trace around to make as many same sized eggs as you desire for your banner. 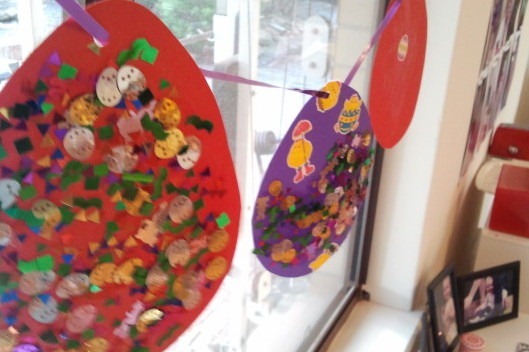 Or go nuts and make a banner with different sized eggs – my, aren’t you creative!? Cut out all your eggs. 2. 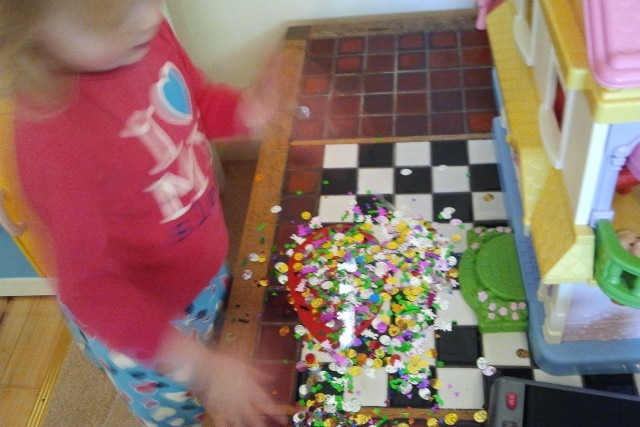 Hand the egg shapes, decorations and glue to your toddler and let them go for it. We like mini glue sticks for little hands and minimised mess, but use whatever glue you have to hand. NOT super glue. Obviously. After a slow and careful start with some delicate placement of glittery bunnies, Pebble’s technique soon evolved into a more slather/sprinkle/splatter approach. Both were equally effective. Go with it, let them have fun. And yes, she’s still wearing her PJs mid morning. What of it? 3. Pebble inserted this step, very important… put your eggs in the sun to dry. 4. Use the hole punch to punch holes (duh!) through the top of each egg and thread your string or ribbon through each hole. You can tie each egg in place so they don’t all slip together in a bunch, or discover that you should perhaps have done that earlier and then use double sided tape to secure the eggs instead. It’s a win either way! At this point you should give in to the idea that the toddler is over this craft business and wants to play with the shiny purple ribbon instead. I repeat: go with it, let them have fun. 5. Hang your Easter banner somewhere for you and your cherub to admire. 6. Go make yourself a cup of tea and pat yourself on the back for being tops as. Got a baby? 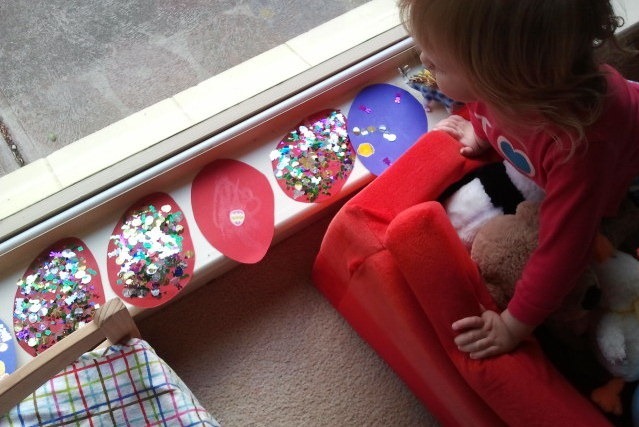 Try torn up pieces of coloured paper to stick on instead of tiny, sharpish, glittery bunnies. And stay in charge of the glue! Got a preschooler? 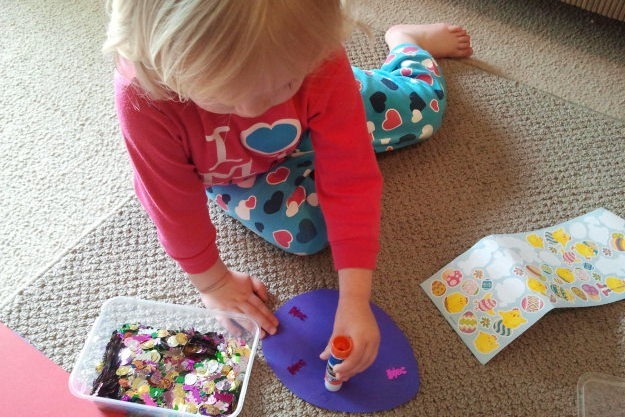 Encourage them to make patterns and and add extra details, and get them to cut out their own eggs or decorations with appropriate scissors. Got a school kid? Ask them to draw and cut out their own egg shapes and make their own decorations out of card, tissue paper and the $2 shop basket (you know, beads, feathers, flowers, pipecleaners, ribbons, popsticks). They could also create bunny head shapes to alternate with the egg shapes on the banner.